Blocked up toilets can be nasty and frustrating. Keep your pipes clean of debris and waste with these well-designed toilet plungers. Let’s just say that it’s an item that most people don’t really think too much about. For some, it’s really only important for those times that you need it! But aren’t all of them the same? I mean…really…it’s a toilet plunger we’re talking about here! It may be somewhat surprising, but there is more to the toilet plungers that are on the market today than just simple functionality. Designs and feature sets have allowed several models to rise above the rest. Choosing the right one for your application may seem difficult considering that point. Here are our picks for the best toilet plungers you can buy in 2019. Our reviews cover quality options plus much more. Simply put, a toilet plunger isn’t necessarily just a “toilet plunger”. There are several types available, with each having strengths towards particular situations. Let’s take a look at a few of the ones you may be most likely to come across. A standard cup plunger may be the first thing that you think of when the term “toilet plunger” comes to mind. In its simplest form, it has a handle (made of various materials) and a rubber cup-shaped end that is designed to form a seal around the drain in the bottom of most toilets. While effective, they can present a challenge as toilets do not provide a flat surface such as that you would find on a kitchen sink (plungers can be used for drain clogs as well). You may find that the seal isn’t the best; therefore it may not work as well as other, more advanced designs. Similar to a standard cup plunger, a toilet flange plunger has the added benefit of – you guessed it – a flange that goes around the base of the rubber cup. It is smaller in diameter than the main cup, which allows it to fit inside the toilet drain. This will greatly enhance its ability to get a good seal on the curved and irregular surface that toilets typically have. The flange can be “dual purpose” as well – it can be folded up into the main cup so you can use it on flat surfaces (such as your sink). An accordion plunger also has a small flange on the end, making it a good choice for toilet clogs. It gets its name from the accordion-style body that is above the cup. This design will give you extra power – a big plus for clogs that are heavier and harder to clear out. While that sounds great, you may find that the material is quite a bit harder than a rubber cup plunger, making it harder to use. That’s also a reason why getting a good seal may be more difficult. To sum it up – they work great, but there are challenges to get them to work consistently and without considerably more effort. Most household users have no idea what a taze plunger is. It is typically used by professional plumbers for difficulty clogs in larger pipes, such as the main sewer line going out of your house (to either the municipal sewer system or to a septic tank). They work by having a round disc attached to a steel rod. The disc is sized to fit into a particular size of pipe (some models have interchangeable discs for the different sizes of pipe that you may encounter in a home). Effective? Yes. Meant for regular household use as with other types of plungers? Not really. That’s particularly because proper operation means getting access to the pipe itself. That’s much more difficult than trying to push the clog through by using a plunger on the toilet drain – hence the designation as a “professional” tool. You’ll find that the handles on most plungers are manufactured from one of three materials: wood, plastic, or steel tubing. Wood is by far the most basic and is found on most of the inexpensive models. Hard plastic is a step up, and some models may even have some ergonomic design molded in to make the plunger more comfortable to use. Thin-walled steel tubing adds a level of strength and longevity that wood may not provide. At the same time, it usually will have a molded handle pressed onto the end. While it keeps the end of the tube from being exposed (and potentially cutting into your hand as you use force), these handles may not have the molded features that a plastic handle may have. The most important feature of a good toilet plunger is its ability to create a good seal around the toilet drain. Without a quality seal, any plunger – regardless of the type and/or design – will not work as efficiently as it should. We’ll discuss how a plunger actually works a little later on. The best plungers are those that combine enough durability for heavy duty use along with being relatively lightweight. Heavier models will take more energy to use, resulting in fatigue. Most plungers you will find are relatively light, though there are ones that may be a bit on the heavier side. Overall, the weight may be a consideration but in my opinion, it certainly isn’t a major factor. Drip trays actually serve more than one purpose. The main intent is to help keep your bathroom neat after using it by collecting any residual water that may be left on the cup. They also help to hold the plunger in an upright position which promotes faster drying. Some plunger models come with a drip tray that is aesthetically designed to match – that can keep it from being an eyesore when compared to the décor of the overall bathroom. How easy a plunger is to use is related to the overall design and the materials used in its construction. From a design standpoint, there are models that can be called “automatic”. They use a type of compressed gas to provide the force needed to break up or move a clog. It goes without saying that these can be much easier to use than continually stroking up and down for a repeated period of time, especially on those tougher clogs. Regarding materials, softer ones (such as rubber) may allow for a better seal as compared to harder plastics such as those found in some accordion style plungers. A toilet plunger is best stored close to the toilet bowl. You’ll most likely find them either right next to the bowl or in a corner. That being said, they aren’t exactly the most visually exciting thing that you may want to see in your bathroom. You may want to look for models that have an aesthetically pleasing visual design. Let’s face it – a basic standard cup plunger with an old wooden handle certainly would take away from what may be a bathroom with well-chosen décor. Some models come with drip trays that match the color and materials used for the plunger itself; they are intended to be stored out in the open and not be a distraction. Our top pick for the best toilet plunger is the Neiko 60166A. You may think that “a toilet plunger is just a toilet plunger”, right? This model has an impressive feature and benefits set that earns the right for it to be in your bathroom. The handle is constructed of aluminum. This offers strength similar to steel without the worry of it ever rusting out, and it will not be a breeding ground for bacteria as a traditional wood handle may be. It also makes the model more lightweight as well. The handy hook insert on the end not only covers the end of the tube but also lets you hang it for easy storage. The unique design of the bell is where the Neiko really shines. It’s a custom design based on an accordion style, but you can tell that a good deal of thought went into its development. The accordion is made up of several stages where the diameters decrease as they move towards the end of the bell. This, coupled with the pliable rubber material, will give a good seal on just about any style of a toilet – even if you are slightly off-angle. Another key point that sets the Neiko apart from other accordion-style plungers is that there are no sharp edges molded in. This prevents water from collecting, enabling faster drying. The design also will not flip back in on itself as many traditional toilet flanges are prone to do. Taking it all in, the features and functionality of the Neiko 60166A plant it firmly at the top of our list. The surface shape of an elongated toilet can make it difficult to use a traditional toilet plunger for those times when things clog up. With its unique beehive bell design (coupled with the innovative T-handle), the Korky 99-4A Beehive Max is, in our opinion, the top pick for the best plunger for elongated toilets. The bell is designed with elements of both a toilet flange style and an accordion style. That, in addition to the flexible bell material, will give you extra plunging power plus the ability to get a good seal regardless of the toilet bowl style. One great feature is the T-handle. With most plungers, you have to grip it along the handle, hold it as hard as you can, and make the plunging strokes. The T-handle lets you apply extra leverage so getting the power you need is much easier. Just remember – too much force can cause problems (even breakage) with your toilet bowl. As they say – “with great power comes great responsibility”. Use it wisely! The Samshow Drain Buster presents a unique method of generating the force needed to effectively unclog a toilet, making it perfect for both new and old toilet installations. Instead of a traditional stationary handle, the Drain Buster is actually an air cylinder where the piston doubles as the handle. That means that, as the handle is moved back and forth, you will get the benefits of using compressed air to transfer the plunging force. This allows for excellent ease of use and greatly reduces fatigue. The stainless steel piston has a molded handle on the end that is ergonomically correct for your hand, giving greater comfort. The bell can be interchanged with other sizes and shapes. This will give you the flexibility to clear out clogs in just about any toilet design, and you can even use it on your sink or bathtub (by using the right bell attachment). One feature that sets this toilet plunger apart from the rest is the 18-month manufacturer’s warranty – an uncommon find in the toilet plunger market. It makes sense though, seeing as how the design is more complex than a traditional plunger. Let’s face it – toilet plungers are a necessary evil. You have to have one, but sometimes there isn’t a good place to store it within your bathroom that will keep it out of view. The Simplehuman Toilet Plunger and Caddy set is a great solution. Not only is it efficient and functional, but it is also stylish enough to fit right in with almost any style bathroom décor – making it our pick for the best toilet plunger and caddy combo. The stainless steel handle gives strength for heavy duty use and will not allow for any bacteria, mold, or mildew growth. It also has an aesthetically pleasing dome-shaped cap that covers the end of the tube – it not only looks good but it also gives you an extra leverage point to apply more force during your plunging stroke. The toilet flange-style bell is made of a flexible rubber material that will conform and give a good seal to almost any toilet design. While supple, it is designed so the flange portion can’t fold back up into the bell – that’s a common annoyance with some flange-type plungers. It also is replaceable in the case where it may get torn or damaged. The caddy design itself is impressive as well. There is a magnet located at the top that actually works with the type of stainless steel used for the handle, making storage quick and easy. The attractive caddy also has a slide out tray that collects any residual water, making cleaning and maintenance a piece of cake. If you’re looking for functionality with a touch of style, then the Simplehuman Toilet Plunger and Caddy set may be the right choice. The Mr. Clean Turbo Plunger/Bowl Brush set is a great combo that will give you the tools you need to take care of your toilet. In fact, it is our choice for the best toilet brush and plunger set that you can find on the market. Have a clog? Not a problem – the included plunger has a sturdy plastic handle with a rubberized insert for comfort when in use. The soft and flexible toilet-flange style bell will give you a great seal, making it much easier for your plunging efforts to work on those stubborn clogs. A big benefit is the addition of a toilet brush to the plunger/caddy set. Instead of storing an unsightly toilet brush under the sink, it nests in the caddy right along with the plunger. It also has a plastic handle with the same comfortable rubber insert that the plunger does. The caddy is stylish and fully functional with a non-slip base to keep it in place. One benefit is that the individual components of the set can be purchased separately. That keeps you from having to buy a whole new set in the case that either the plunger or the brush gets worn or damaged from use over time. Mr. Clean is well known for having a great lineup of household cleaning items (Magic Eraser ring a bell? ), and the Turbo Plunger and Bowl Brush Caddy set is no exception. The guy knows his stuff when it comes to keeping your home clean! The OXO Good Grips Toilet Plunger and Caddy set may be just the thing if you’re looking for a power plunger that looks great in your bathroom when not in use. The plunger handle has a molded knob integrated into the top. This gives you a good leverage point for the palm of your hand – that helps to provide the extra downward force that you may need for more stubborn toilet clogs. The toilet flange style bell will not fold back in itself, and it is flexible enough to grant a good seal on most toilet bowl designs. The caddy design was well thought out to where it will remain sprung open when the plunger is in use, and it will completely cover the plunger bell when it is set in for storage (hence the name “Hideaway”). Don’t be concerned that the water won’t be able to dry out – the caddy has ventilation slots that allow any residual moisture to quickly evaporate. When functionality meets style, you get the OXO Good Grips Toilet Plunger and Caddy set! Toilet plungers have a tough job. Think about it – would you want to be submerged in sewage water and then get agitated up and down? I’ll pass, thank you. Just thinking about the germs and contamination that are involved is certainly unpleasant. That’s why the Kleen Freak Antibacterial Toilet Plunger is what we recommend as our best choice in this regard. It comes with Germ Guard, an antibacterial coating that is a great defense against the buildup of bacteria, mold, and mildew. Not only can these things be unsightly and produce offensive odors, but they also could present health hazards as well if they are allowed to grow unchecked. The plastic handle is molded to increase in diameter towards the top, making it easier to grasp during the plunging process. The toilet flange style bell gives a good seal on most toilet bowl styles, which is imperative for proper plunger effectiveness. The included drip tray helps to keep your floor clean and makes the package aesthetically pleasing when it is in storage. Old-school plungers with untreated rubber and wooden handles can become breeding grounds for all types of nastiness. With the Kleen Freak, you don’t have to worry about it! Time to break out the big guns! Toilet plunging can be a bit exhausting, especially when you have a clog that is so stubborn that it takes repeated plunging to get it taken care of. With the SurePlunge Automatic Toilet Plunger, you can blast that clog out of the way with a simple press of a button! Traditional plungers work by good old elbow grease – you position the plunger properly to get a good seal, then vigorously plunge up and down to provide the force needed to dislodge whatever junk may be clogging your toilet. The SurePlunge eliminates all of that by using a pressurized CO2 (carbon dioxide) canister to deliver the force needed to obliterate even the most difficult clog. Each canister is a single-use, but it supplies a great deal of power. Installing the canister is a breeze as well – all you have to do is unscrew the cap at the top of the plunger handle. It can’t be any easier to use – simply insert the neck of the plunger into the toilet drain. You’ll note that there isn’t a traditional bell on the end – it is shaped to fit down into the drain, and then create a seal with the base of the toilet bowl with a flat flange molded into the top of the endpiece. Constructed from silicone, it will compress to just about any style of toilet. Once it is inserted properly, make sure that you are holding it firmly to avoid any pressure from kicking back. Simply press the button and you’re done! Replacement CO2 cylinders are relatively inexpensive; I would say they are cheap enough that it’s worth all of the benefits that the SurePlunge will give you. Also included is a stylish stand for storage neatly around your toilet bowl. It also has a one-year limited warranty in case you run into any problems. Add that to the incredible ease of use, low operational cost, and effectiveness that the Sure Plunge provides…you can see why it is our top pick for the best automatic toilet plunger. The Get Bats Out Rubber Toilet Plunger is a traditional plunger that just does what it is supposed to – get rid of clogs in your toilet. It is constructed with a sturdy, easy to clean plastic handle and a rugged rubber bell designed for heavy-duty use. The design of the flange on the bell will allow it to fold up, giving a flat surface that can be used for clogs in a sink or a bathtub. If you’re looking for a simple, old-school plunger that will do the job, then the Get Bats Out Plunger may be your perfect choice. Toilet plungers are relatively inexpensive for the most part. Based on how many features a particular model has, you can expect to pay accordingly. The Everflow Force Cup Plunger is our choice for the most affordable toilet plunger, simply because it is a quality “no-frills” model that will get the job done. That’s not a criticism – sometimes simple is the way to go! It is the most basic plunger on our list. With a strong wooden handle and a toilet flange style bell, you should be able to manage most clogs without having any issues. The bell does unscrew from the handle in case it ever needs to be replaced. Plunging on a budget? Then the Everflow is the model for you. Sometimes you have to shake your head in wonder…and get a good laugh in at the same time! The Squatty Potty Emoji Poo Plunger is a perfect balance of a great product that has a sense of humor as well. Have you ever seen that emoji that looks like…well…you know…a big pile of poo? No accounting for taste, the folks at Squatty Potty have taken that emoji and designed a toilet plunger bell that looks exactly like it. If that style of humor is up your alley, then you’ll have no problem having the Emoji Poo Plunger proudly on display in your bathroom! The impressive thing about it is that it really is a good quality item. The plastic handle is heavy duty enough to take on the toughest plunging, and the unique “bell” is made completely out of a pliable rubber to get you that good seal we have mentioned throughout. The flange will fold up into the bell, letting you take your poo and put into good use for a sink or bathtub clog as well. Truthfully, it IS funny- and it’s a great product! Life is tough enough; there’s nothing wrong with getting a good chuckle in every now and then, right? How does a toilet plunger work? 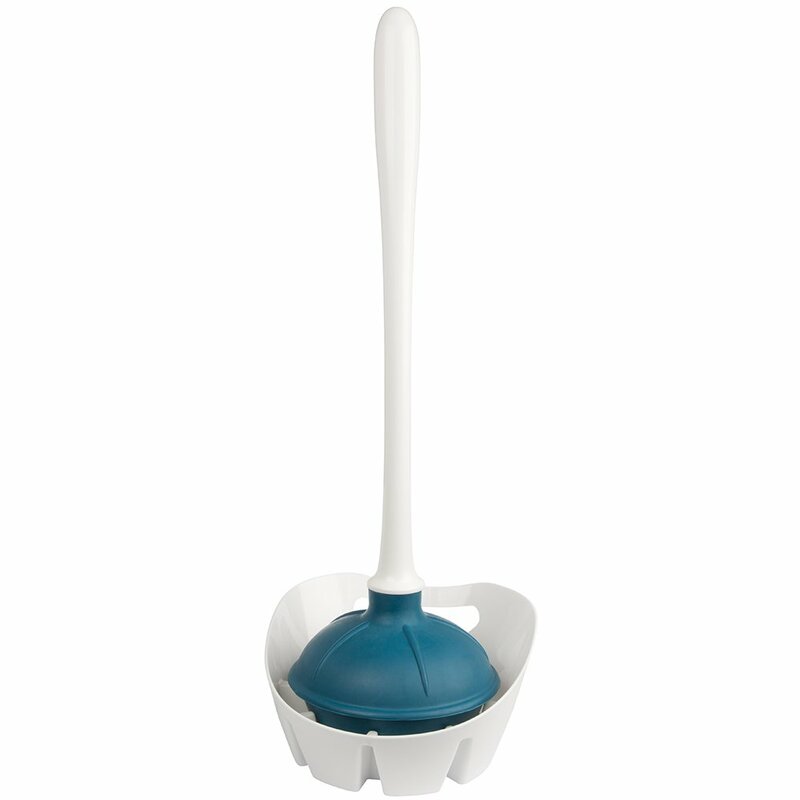 Plungers work by directing the force of the plunging stroke into the water that is in the toilet. Water doesn’t compress in the same manner that air does, so it will act as a solid piston that pushes against the clog. The force will work properly only if the seal is adequate. If it isn’t, water can escape around where the plunger contacts the toilet. This will greatly reduce the amount of pressure that is being applied to move the clog along (or break it up). Depending on how bad the clog is, the back-and-forth motion will either break the clog up, or it will move it along the pipe until it goes into a larger pipe. Then the clogged material will be free to be taken out of the plumbing system as normal waste would be. Use the best type of plunger for the application (I would always prefer a toilet flange plunger over a standard cup). Lay towels around the base of the toilet to collect any water that may splash out of the bowl. With the vigorous plunging motion that most plungers require for proper use, it’s a given that you’ll be getting some water on the floor. Water is your friend when plunging a toilet! If the water level is low then you may need to add some in order to get rid of as much air as possible. Air is a compressible gas, so it will not transfer the energy from your plunging efforts nearly as well as water will. Make sure that you are applying the plunger as straight over the toilet drain as you can. Even if you are using the right plunger type, not being in the proper position will make it difficult to get a good seal. Realize that it may take more than a few strokes to clear up the clog. Repeated plunging motions for up to 20 seconds may be needed. You’ll be surprised at how tiring that may be, so take a short break if you have to repeat the plunging process. When should I call a plumber to unclog my toilet? It’s certainly frustrating when, despite your best efforts, your toilet just won’t unclog. It’s best to stop at this point before you make matters worse. Some may think that they can rent professional tools (such as a power auger), but without a good knowledge of how these tools work you can damage the pipes and have an even bigger problem than before. Sometimes a clogged toilet may be a symptom of a bigger problem, like a plugged mainline. A sign of that may be seeing water backing up into your sinks or bathtub when you flush. This is definitely a sign that you may need to call in a professional to properly correct the problem. How do I unclog an overflowing toilet? We’ve all done it at some point (I know that I have) – you flush, the toilet gets clogged, and the toilet then runs to the point where it overflows onto the floor. That much water in the bowl will make plunging a messy job, for sure. The first step is to take the lid off the tank and manually close the flapper – that will stop any more water from flowing into the tank. Also, close the water supply valve as well. To get the extra water out, grab a set of rubber gloves (to avoid your exposure to any sewage) and get a bucket to bail out some of the water. Once you get it to where it is around half-full you can then start the plunging process. How do I fix a severely clogged toilet? Proper plunging is always the first recommended step. If that doesn’t work, you may try using a snake or an auger. As mentioned earlier, though, do not go to that extreme if you don’t know how to properly use the tools – at that point, it may be time to call a pro. Can a plunger cause damage to the toilet? Typically, no – not if they are used properly. There are cases where problems can be caused, though. Too much force on the plunging stroke can break the wax seal that is found between the toilet and the floor, and - in extreme cases – could even crack the toilet itself. As long as you have a good seal it should not take a large amount of effort to properly plunge out a clog. Can too much toilet paper clog a toilet? Without a doubt! Some people may simply use too much at one time. Another factor to weigh in is the type of paper that is being used. Some thicker papers do not dissolve very well and can lead to clogging problems. How do you clean a toilet plunger? It goes without saying that, simply due to the nature of where it’s used, a toilet plunger should be adequately cleaned after each use. Using a bucket, swish the plunger around in a mixture of bleach and detergent. Rinse again when done. Place vertically in a drip tray and allow it to air dry. A clogged toilet doesn’t have to be a disaster – not if you have the right plunger for the job. By doing some research you should be able to select a plunger style and model that best fits your toilet type. Our top choice of the Neiko 60166A takes everything that we’ve discussed into account, and it has certainly earned the distinction of being our #1!